Relationships are among the top concerns with regard to the things that clients ask during an astrology consultation. You find that relationships influences and form a large part of our everyday lives; at work, at home or with friends. 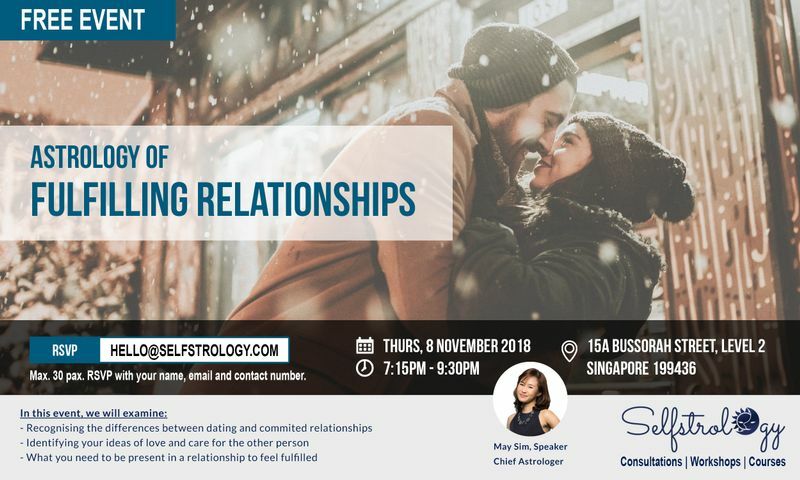 In this event, we will examine what needs to be present in a relationship for the people involved to feel happy and fulfilled. Also, recognising the ideas of how we love and care for others in our lives. May Sim is a full-time astrologer who serves as Chief Astrologer at Selfstrology Academy and also sees clients as a consulting astrologer. She is the first Asian graduate with a 3.5-year Diploma in Modern Astrology and also the first Asian lecturer from the International Astrology Academy (IAA). May specialises in Psychological Astrology and has been practicing for 15 years. Since 2013, till date she has seen over 1000+ clients in consultations including Doctors, Lawyers, Judges, Business Owners, Working Professionals and Married Couples.